This set of Compilers Multiple Choice Questions & Answers (MCQs) focuses on “Lexical Analysis – 2”. 1. What constitutes the stages of the compilation process? Explanation: As defined in the compilation process. 2. The lexical analyzer takes_________as input and produces a stream of_______as output. Explanation: The input that we give in high level language is also known as the source language. Explanation: For the convince of the user compilers are made re-enterable. 6. 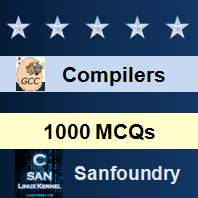 Which of the following is not feature of compiler? Explanation: The objective of the compiler is clearly not to increase the execution time of the program. Explanation: A loader which brings together the functions of a relocating loader with the ability to combine a number of program segments that have been independently compiled into an executable program. Explanation: This is a logical error can’t be detected by any compiler or interpreter.